Can Fusion up the virtualisation ante when it comes to speed? 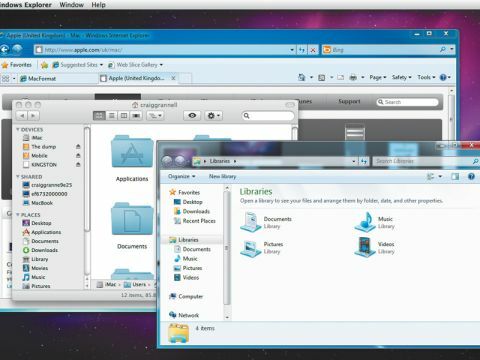 With the eternal punch-up between virtualisation apps VMware Fusion and Parallels Desktop in relative abeyance, Fusion re-enters the ring slightly fleeter of foot, this latest update largely intended to boost the application's performance. VMware's website throws exciting figures around with merry abandon: "35% better end-to-end application performance […] according to WorldBench 6," and "up to 5X better 3D graphics performance". Unfortunately, our own tests dulled the buzz VMware's numbers provided. On the positive side, VMware Fusion 3.1 definitely and noticeably improves performance across the board. Virtual machine suspension and Microsoft's Aero graphics under Windows 7 get particularly obvious boosts, and graphics in 3D games are often rendered more satisfactorily. However, the app still regularly remains slower than its rival (especially when resuming suspended machines); and while 3D games might look better than in previous versions of Fusion, our perhaps slightly ambitious aim of getting the likes of Race Driver: Grid to run resulted in something more akin to stop-motion animation than fluid gaming on our test Mac. Simpler and slower games fared better, but until something magical happens to virtual machines, anyone wanting to play PC games should definitely stick to Boot Camp. The other improvements to Fusion in this update are mostly a mix of workflow-oriented changes and technological achievements. Fusion's already impressive USB device support is further refined with EasyConnect, which pops up a user-friendly dialog box when you plug something into your Mac, enabling you to assign it to your Mac or a virtual machine on a temporary or permanent basis. Elsewhere, migration is faster, and Unity (Fusion's name for the technology that enables you to mingle Mac OS X and Windows windows) works better with Mac OS X – Exposé support is particularly impressive. That said, full integration with the Mac remains a pipe dream, since application-hiding is still broken (either every Windows app hides or none do), while 'tearing' and general visual oddness remains evident when moving windows, especially when using translucent Aero windows. On the more 'technical' side, there's now scope for larger virtual machines, with support for 2TB disks and eight-way symmetric multiprocessing. Fusion 3.1 also brings support for various recent flavours of Linux and Ubuntu.